Ah….those fabulous days when I went for a bi-weekly pedicure at the salon. Then I had three children and now I can’t even remember that last time I treated my poor feet to a pedicure. With spring here, I will be sporting sandals every day and want my feet to look and feel great. Therefore, I was very excited to discover ARCH by Dr. Krista Archer. ARCH was developed by Dr. Archer as “skincare for feet” and the Sole Savour product line is exceptional because it really works while being naturally derived. I love that it does not contain sulfates, parabens or artificial fragrances. I have been using the three essential products in the line including the Sole Savour Scrub, Sole Savour Nail Oil and the Sole Savour Crème and notice definite improvement in the overall condition and appearance of my feet. First, I use the Sole Savour Scrub (SRP 4 ounces/$20) to exfoliate and clean my feet while in the shower. A small amount goes a very long way and I love how this product helps buff away rough, dead skin with gentle pumice action. I had noticed a callused area developing on my big toe and after using this product several times along with the other two products it is now virtually unnoticeable. My rough heels feel great after the first exfoliation and even better with each bi-weekly use. This product feels very refreshing and has a wonderful natural scent derived from Rosemary, Thyme, Lavender and more. I appreciate that it also includes cinnamon Bark and goldenseal extracts which have anti-bacterial and anti-fungal properties to keep feet healthy and fungus-free! Next, I dry my feet and apply the Sole Savour Nail Oil (SRP 1 ounces/$30) to my toenails and cuticles. I immediately noticed one of my favorite scents, tea tree oil (10%) which is my go-to antiseptic, antibacterial and antifungal. It also helps to refresh with additional essential oils such as coconut and jojoba. The ARCH New Sole Savour Crème (SRP 1.7 ounces/$35) now features Emu oil which studies have shown can “penetrate through several layers of the dermis and “feed” the skin”. I have used Emu oil successfully in the past for my daughter’s eczema and it was very helpful. All I need is two pumps of this luxurious cream applied all over my painful skin cracks twice per day. I also use it on my daughter’s heels which are cracked too and she loves how it feels. I appreciate that this product has absolutely no greasiness and instead absorbs right into the skin so my feet feel great! 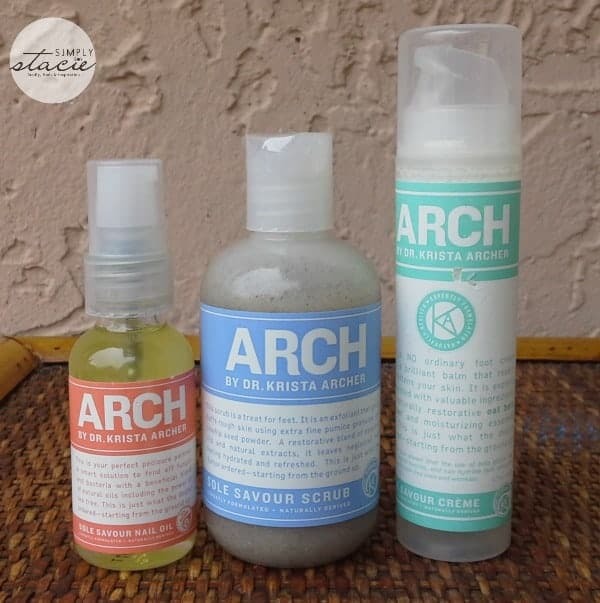 Overall, I am very pleased with my experience using ARCH products! My feet are now ready for a nice pedicure so I can head out in my sandals with confidence. You are invited to visit the ARCH website to learn more (there is tons of useful information) about this product line and purchase your favorite products. You can purchase each product individually or I recommend trying the complete regime which provides all three products for $80. I learned that Dr. Archer graduated with honors, and was one of the top 10 students in her class at Temple University’s School of Podiatric Medicine…wow! Thank you for the giveaway!! Thanks Stacie & Maureen for writing such a nice review of my ARCH line. And thank you everyone for such nice comments! It’s been a pleasure hearing from you all and connecting with you all on social media! I learned that podiatrist Dr. Krista A. Archer is a surgeon, former athlete and a marathon runner. She went to Temple University. She went to Temple university! For most people, it is usually enough just to eliminate the source of friction or pressure, which makes calluses disappear. I learned that a major cause of bunions is abnormal mechanical function of the foot that is inherited. The more you know! NYC Podiatrist Dr. Krista A. Archer is a surgeon who prides herself on attention to detail and excellent cosmetic results. As a former athlete and marathon runner, she enjoys treating sports-related and exercise-induced injuries. As a fashion lover, she understands the torture behind gorgeous high heels, and is determined to make them wearable. I learned that Sole Savour Nail Oil contains tea tree oil. I like the Sole Saviour Nail Oil. I read that Dr Krista Archer was a former athlete and marathon runner, so she likes to helps people with sports related injuries. Thanks for the opportunity to win! NYC Podiatrist Dr. Krista A. Archer is a surgeon who prides herself on attention to detail and excellent cosmetic results. I learned that onychomycosis is nail fungus. I learned that over time the ball of the foot thins and shifts so the foot bones are no longer well padded and causes pain. I would like to try the ARCH New Sole Savour Crème. I learned that heel pain is one of the most common foot complaints. i really like the ARCH Sole Savour Scrub – 4 oz, I could really use it to soften my feet! I learned that you can get injections in your feet!! I am interested in the ARCH Original Sole Savour Creme. I tend to neglect my feet until they start to ache. I learned that: As a former pedicure lover, she is developing products to make going to the salon less worrisome and more rewarding. Dr. Krista A. Archer is a surgeon, former athlete and a marathon runner. I like the service offered for nail fungus. I love that the site covers ALL the foot topics, what all the symptoms are and ways to treat. I never realized you could actually do something about some of the issues. I learned that there are laser treatments for toenail fungus. I learned that they offer services for 15 different conditions! Heel pain is one of the most common foot complaints and well-fitting shoes will help decrease the pain. I like the Original Sole Savour Crème. I just learned that, over time, the fat pad that protects the bones at the ball of the foot thins and moves out from under the end of the foot bone(s). Therefore, the bones are no longer well padded. This can cause pain and sometimes burning during walking, especially as heel height increases.